i. Prime Minister Narendra Modi launched a payments bank of the Department of Posts that will take banking to the doorstep of every citizen through an unmatched network of post offices and almost 3 lakh postmen and ‘Grameen Dak Sewaks’. ii. The India Post Payments Bank (IPPB) will be like any other banks but its operations will be on a smaller scale without involving any credit risk. It will carry out most banking operations like accepting deposits but won’t advance loans or issue credit cards. iii. The payments bank will accept deposits of up to Rs 1 lakh, offer remittance services, mobile payments/transfers/purchases and other banking services like ATM/debit cards, net banking and third-party fund transfers. The IPPB would be available through 650 branches and 3,250 access points. i. Minister of State for AYUSH Shripad Yesso Naik inaugurated the Fourth International Ayurveda Congress (IAvC) at the Netherlands. ii. The congress would focus on promotion and propagation of Ayurveda in the Netherlands and its neighbouring countries of Europe. A special Seminar is also organized by the Indian Embassy titled “India-Netherlands collaboration in Healthcare, including Ayurveda”. · Netherlands Capital: Amsterdam, Currency: Euro and USD. i. The 4th BIMSTEC Summit has been successfully concluded in Kathmandu, the capital of Nepal. ii. The Prime Minister of Nepal K.P. Sharma Oli presented draft Kathmandu declaration which was unanimously adopted by the all member states. 1. The Kathmandu Declaration has underlined the importance of multidimensional connectivity as a key enabler to economic integration for the shared prosperity of the region. 2. The declaration also highlighted the importance of trade and investment as one of the major contributing factors for fostering economic and social development in the region. 3. The BIMSTEC leaders strongly condemned terrorism in all its forms and manifestations and stressed that there can be no justification whatsoever for any act of terrorism. 4. An MoU was also signed during concluding session of 4th BIMSTEC summit on the establishment of BIMSTEC Grid Interconnection to enhance energy cooperation among the member states. 5. Sri Lanka has become the new chair of the BIMSTEC. i. Home, auto and other loans would become costlier as the country’s largest lender, State Bank of India, has increased its benchmark lending rate or MCLR by 0.2%, a development followed by other lenders. The new rates are effective with immediate effect. ii. SBI has increased the lending rate by 20 basis points across all tenors up to three years. Now SBI’s overnight and one-month tenor marginal cost of funds based lending rate (MCLR) stands at 8.1% as against 7.9%. · SBI Chairman- Rajnish Kumar, Headquarters- Mumbai, Established on- 01st July 1955.
i. Indian economy grew by 8.2% in the first quarter (April-June) of the current fiscal, the highest in over two years. This announcement was made by Finance Minister, Arun Jaitley. The manufacturing sector grew by 13.5% which signals very good turnaround in the sector. ii. In a related development Reserve Bank of India stated Non-food credit growth in the system accelerated to 10.6% for July as compared to previous year, driven by loans to the services sector growing at the faster clip. iii. Credit to the services sector grew 23% for the reporting period, up from the year-ago period's 4.9%. i. Binoy Kumar has taken over as Secretary, Ministry of Steel, Government of India. He had been posted as Officer on Special Duty in the Ministry. ii. Prior to this, Binoy Kumar held the post of Special Secretary, Logistics, in the Department of Commerce. i. India's 22-year-old boxer Amit Panghal defeated 2016 Olympic champion Hasanboy Dusmatov (Uzbekistan) in the men's 49kg final to bag gold at the Asian Games 2018.
ii. Amit was the only Indian boxer who made it to a final at the quadrennial event. 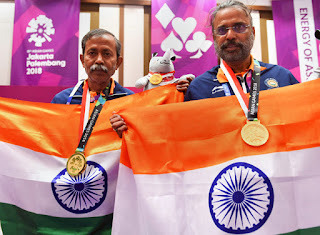 i. India's 60-year-old Pranab Bardhan and 56-year-old Shibnath Sarkar won the men's pair bridge event to bag the country's first-ever gold in bridge at the Asian Games. ii. 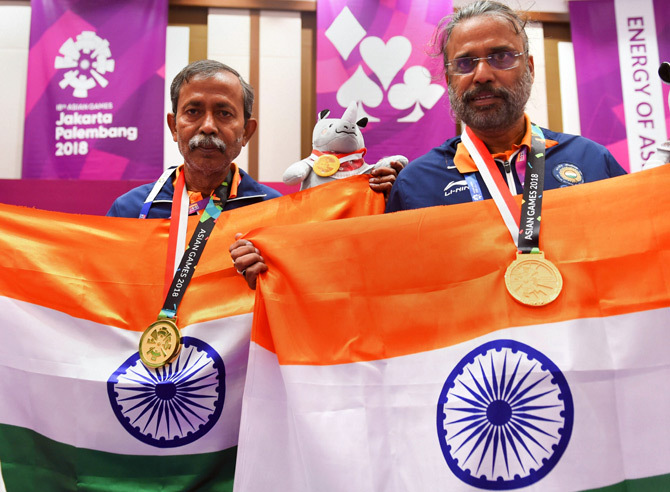 The card game has been featured as a sport at the Asian Games for the first time, in the 2018 edition. China won silver in this event. i. Jain Muni Tarun Sagar passed away at the age of 51 in Delhi's Radhapuri Jain temple due to prolonged illness. ii. The monk, who was known for his lecture series 'Kadve Pravachan', was suffering from jaundice and other ailments.